COLOMBO, Sep 15 2009 (IPS) - Tea lovers around the globe may soon have to pay more for every cup of their favorite beverage. That is, assuming tea plantation workers in one of the world’s major tea-producing countries get their demand for a significant increase in their daily wages. Employers, however, refused to accede to the workers’ demand in their latest face-off — part of a series of negotiations that have dragged on for months and failed to end conclusively on Sep. 14. “We were unable to finalise a deal,” said O. Ramiah, secretary-general of the Joint Plantation Trade Union Centre (JPTUC). Yet, he added, “(w)e are hopeful of concluding an agreement” in their succeeding meeting. The JPTUC is one of three unions involved in joint negotiations with the Employers Federation of Ceylon (EFC), which represents the 22 private tea plantation companies that account for 40 percent of Sri Lanka’s tea production. The 60 percent balance comes from more than 22,000 smallholders or private individuals who have small plots of less than one acre. The unions represent 50 percent of the organized workers on estates. The standoff has severely affected the country’s main commodity export as losses continued to mount in Sri Lanka’s tea industry. Data provided by EFC officials, who requested anonymity, show that the companies involved have lost more than 1.5 billion rupees (13.1 million U.S. dollars) since Sep. 2, when workers resorted to non-cooperation, which ranged from strikes and work slowdowns to deliberate lessening of work. Their collective action began after nearly five months of negotiations faltered. They have been negotiating with the EFC since April 2009 when the three-year wage agreement forged in 2006 ended. “This is the toughest collective agreement that we have tried to reach,” said Ramiah. Union leaders, who echoed his sentiment, blamed it on the international financial crisis that broke out last year and the high financing costs borne by companies. 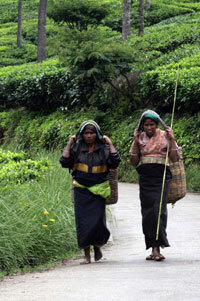 Plantation wages in Sri Lanka are fixed and finalized in a rolling agreement that is re-visited once in three years. Tea workers are demanding a daily wage of 500 rupees (4.3 U.S. dollars) against their current daily take of 290 rupees (2.5 U.S. dollars). They added that their present wage is not enough to feed their families. A government survey in 2006-2007 of household income and expenditure found that 32 percent of people in the plantation sector live in abject poverty. They make up the poorest and unskilled laborers in this South Asian state. Sri Lanka’s tea plantations consist of over 220,000 workers and a dependent population – mainly their families — of close to one million. Approximately 68,000 of the total workforce come from the majority Sinhalese community while the rest are Tamils of Indian origin, whose descendants were brought by British colonial rulers many decades back to work on plantations in Sri Lanka. Tea estates were owned by British companies until the early 1970s when the government nationalized plantations by seizing them. In the late 1990s, the estates were sold off to private companies while the government retained a small stake. According to K. Velayudam, secretary-general of Lanka Jathika Estate Workers Union, another union involved in the negotiations, the companies are offering the workers 405 rupees (3.5 U.S. dollars), of which 285 rupees (2.5 U.S. dollars) will make up the basic daily wage and the rest will comprise attendance and productivity incentives. But the unions are pressing their demand. They said tea workers get only 7,000 rupees (61 U.S. dollars) a month compared to those in other sectors such as garments, who get at least 10,000 rupees monthly. Malik Fernando, director of Dilmah Tea, owners of estates and Sri Lanka’s biggest tea brand overseas, said that productivity is the biggest issue in the plantations. “If they produce more, then we can pay more and cut our costs,” he said. Sri Lanka’s wage component of 60 percent of the cost of production (COP) per kilo of tea is considered the highest among tea-producing countries. Wage costs in India, for example, work out to 40 percent of COP. Tea producers in this country as well as in Kenya, China and Bangladesh — among the world’s major tea producers — make bigger profits than their Sri Lankan counterparts. The long-drawn-out negotiations come at a time when tea prices have soared due to a host of factors, including drought in the producing countries, a slowdown in purchases last year by buyers due to the global economic meltdown, and a fluctuating U.S. dollar. Tea prices in early September averaged 428 rupees (3.7 U.S. dollars) per kilo at the Colombo Tea Auction, up 23 percent from 321.83 rupees (2.8 U.S. dollars) per kilo during the same period in 2008. Prices fetched by other producers were lower than those of the capital, which generally also gets a better price because its tea quality is higher. Globally, tea production is seen falling by over 80 million kilograms this year. Sri Lanka produced only 157 million kg between January and July this year compared to 199.6 million kg during the same period in 2008. This translates to a shortfall of 42 million kg. According to Dilmah’s Fernando, the impact of the proposed new wage hike – though yet to be finalised– would cost a company between 25 and 30 million rupees (217 to 261 U.S. dollars) more on the monthly wage bill. “It would raise the cost of production by 70 to 80 rupees a kilo,” he lamented.